Keep one of our Notecards handy for those personal messages to family or friends. This image is also available in greeting cards, gift cards, bookmarks and prints. The Whimsies Series features Australian wildlife described as "whimsical" or "quirky". 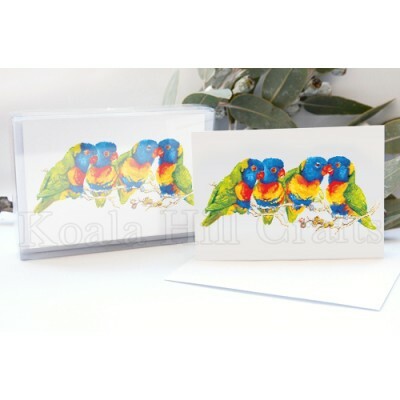 Note: Your items will not have the Koala Hill Crafts watermark on them. Format Artwork on the front, blank inside, back has a brief note about the artist. Artist Lynn Naismith's paintings are exhibited in galleries in Victoria, Queensland, NSW and the ACT. Lynn grew up close to Sydney's Royal National Park. Surrounded by nature, she developed a life-long interest in painting the animals, birds and flowers of the Australian Bush.